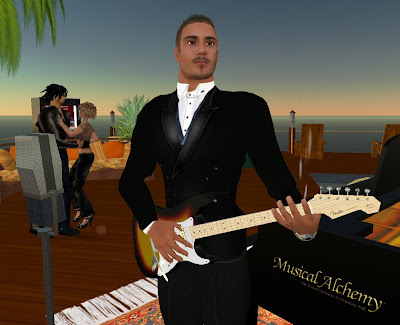 I was lucky enough to meet Tone Uriza a few months ago when he was opening up his own blues club - he was planning to start performing live in SL and invited us to one of his gigs. As the blues he was playing in his club was really good stuff - I checked out his gig and was totally blown away. Tone has taken the live blues performance community by storm. He's performing everywhere - he's not hard to find, check the events listings sometime - he's all over it. I've caught quite a few of his shows and I have never been disappointed. He really enjoys performing, he interacts with his audience, he remembers people's names, and man, can he sing! A very sweet speaking voice and then he gets down and dirty and belts out these songs! His phrasing is so expressive, and his voice is quite an instrument. He's got a good range and he can get so gravelly you can feel it. His voice resonates and you can feel the song through him. Yes, he's THAT good. His performances are a combination of classic and contemporary blues, including some of his own compositions. Tone genuinely seems to be having a blast up there and his audience shares in the fun. His website is on his profile - he's a performer in RL and his band is called Tony and the Torpedoes. They're based in the Soutwest USA. He's also got a MySpace page and his CDs are available on CD Baby. He's amazing, go check him out. Request "Frigidaire Woman." You'll be glad you did. He's opening his new club Blues Heaven this weekend in Atai. See you there! Multiple performances in Atai (9,90,22), check your local listings. 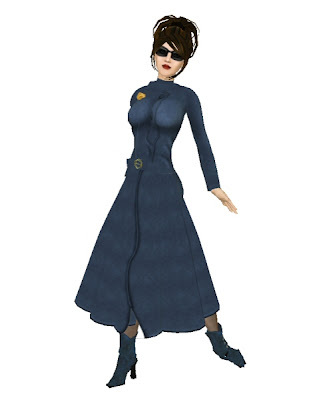 I saw the Agent Pushbutton coat by Marleen Vaughan and just had to have it. Deciding what color to get was not easy. It comes in three colors - Ash grey with pink lining, Indigo with gold lining, and Army green with silver lining. The indigo suited me just fine. It comes as a shirt and pants layer, with prim collar, skirt and hanky to match the lining. It flares nicely and moves as if it has a bit of weight to it - and the lining flashes as you move. The skirt hangs nicely and the prim elements are incorporated into the design seamlessly. Very nice! Her shop is adorable - it's not overcrowded and her designs have a certain retro noir style that is well done without being overdone. She shows a nice sense of humor as well, her wares come with a notecared entitled "the sales thingy you're never going to read". I look forward to seeing more of her work! Marly's Vintage Clothing is located in Envy (158,113, 21). 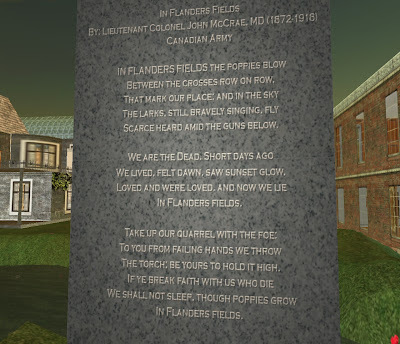 The Remembrance Day Monument in Caledon Tamrannoch is engraved with the poem "In Flanders Fields". It is located beside the Falling Anvil Pub owned by Aldo Stern. 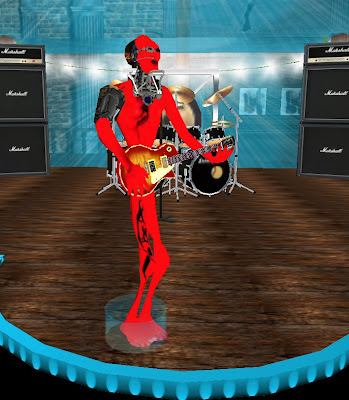 I hit the Komuso Tokugawa concert tonight in the Epsilon sim at LIL Sturgis. The Sim was packed, up to 72 people at one point, all there to see one of the best blues performers in Second Life. Komuso is an Aussie living in Japan, and performs live in SL - traditional blues guitar and harmonica. The guy is just amazing. What a voice - earthy, gritty, and a low growl. And in between songs, that Aussie accent. Swooon! If you get a chance to catch one of his gigs, do it! You won't regret it! After seeing Mat's Deep Sea Siren avatar the other day, I decided that I just had to have one. I set off in search of Grendel's Children, which is the name of the shop where he found it, and I have to say, the place is amazing, but also amazingly hard to find! 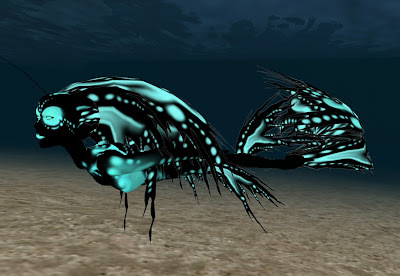 The Deep Sea Siren is only 90L$ if you can believe it. It's by Flea Bussy, and comes in purple, blue, green, yellow, red, pink, orange, and teal, including everything you see here plus an AO. I just love its lithe flexi movements. The shop itself is lovely, and sells a variety of avatars and accessories, by multiple artists, including the illustrious Psyra Extraordinaire. 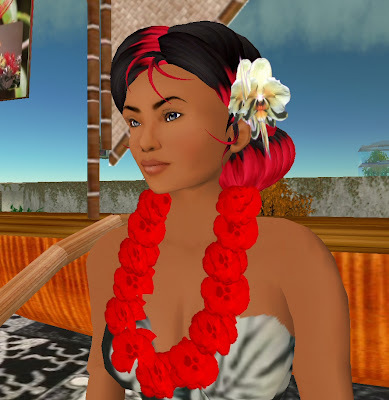 Many of the avatars are quite affordable by recent SL standards. 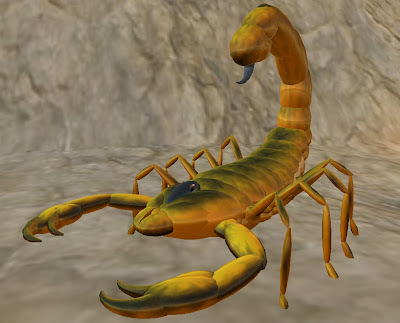 This scorpion is extremely well done, it's made by Memnoch Matzerath and I am not making this up, it costs only 5L$. That's not a typo, that's FIVE. Multiple colors, many of them using shiny to great advantage. I almost look forward to getting backed into a corner now. The selection is amazing. Do visit. 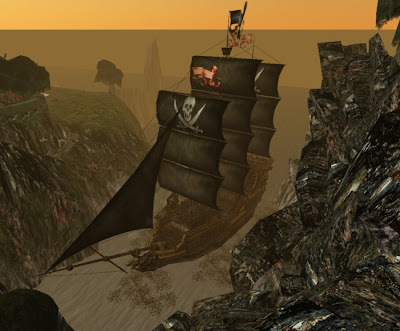 The most interesting avatars wash up on the shores of Mowry Bay. I just loved Mat's new Deep Sea Siren from Grendel's Children, I am so going to have to pay a visit!!! Because it amused me no end. 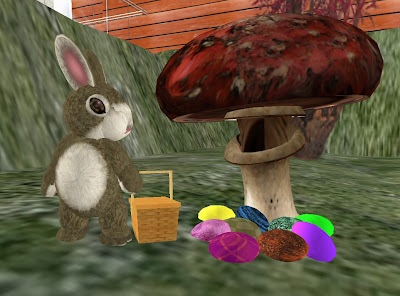 The Electric Sheep Company has a new search engine for objects in Second Life, according to the Clickable Culture blog. 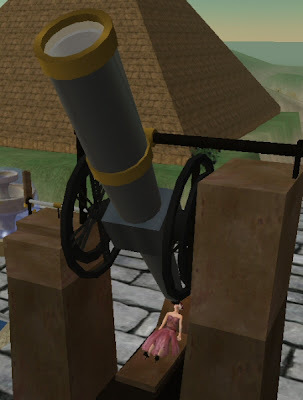 Scanning SL sims daily for objects that are marked "for sale" across the entire public grid. Located at search.sheeplabs.com the new search engine is open to the public and ESC is looking for feedback. Search results are interactive and the list of searchable objects is growing. For those with privacy concerns, you can visit the Electric Sheep HQ on Sheep Island and choose your privacy preferences - Opt In, Opt Out, or the default which includes only objects marked "for sale". Search FAQ and statistics here. ESC blog here with information on sending feedback. May all your eggs be sweet and easy to find. Lehua Lamington, storyteller extraordinaire, opened the Serenity performance venue in grand style with her unique brand of story telling. Lehua tells a delightful combination of story elements - the traditional, the fanciful, the human, the family, the supernatural, - including Hawaiian history and topography and rich culture and pulllllls her listeners into the world that she weaves around them. 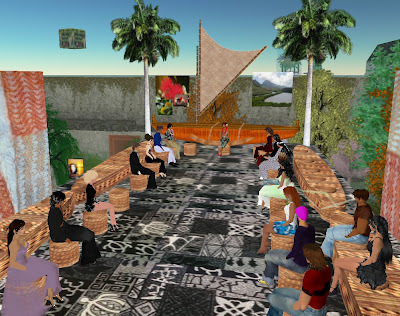 Telling traditional stories with titles such as "Flying Through Pig-shaped Clouds", Lehua enchants and enthralls her audience, which only grows during the performance as friends drag in other friends for this unique type of SL live performance. Lehua uses her rich and expressive voice to tell the stories, in real time, to her rapt audience. You can hear the silence from the audience, as Lehua finishes each tale, the audience silently hoping that the story has not yet ended. Lehua's storytelling is magic. 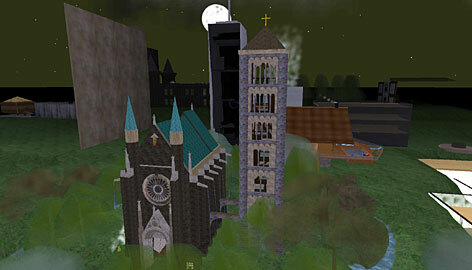 Interesting but brief article today in the McPaper on faith and religion as practiced and expressed in Second Life. A good sampling of faiths and religious beliefs, both traditional and non, denominational and non, organized and un. Apparently, in the season of Passover and Easter and Vernal Equinox, faith is where you find it.